Hassan, Selim. Excavations at Gîza 9: 1936-37-38. 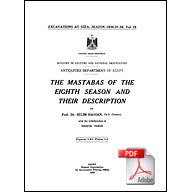 The Mastabas of the Eighth Season and their Description. Cairo: General Organisation for Government Printing Offices, 1960. Remarks Egyptologist; Sub Director General. 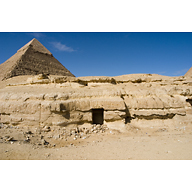 Nationality and life dates from Who was Who in Egyptology. (1886-1961) Egyptian Egyptologist; born Mit-Nagi, 15 April 1886, he studied at the Higher Teacher's College, Cairo under Kamal (q.v. ); in 1912 he became a teacher and in 1921 obtained a post in the Egyptian Museum as assistant keeper; he studied in Paris 1923-7 at the Ecole Pratique des Hautes Etudes; he was the first Egyptian to be appointed as a Professor of Egyptology in the Universitv of Cairo, 1928 - 36; he was later made Deputy Director of the Egyptian Antiquities Service responsible for the care of all monuments in the Nile valley, 1936-39; Ph.D. Vienna University, 1935; stimulated by the archaeological work of P. E. Newberry (q.v.) and Junker (q.v. 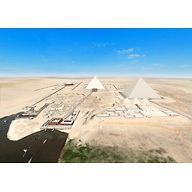 )he began an active career in excavations with the clearance of some of the Giza mastabas in 1929; the excavations carried on by him in this necropolis continued until 1939 by which time a great deal of digging had been achieved, published in 10 parts; he also cleared the Sphinx and its temple, for the first time completely digging out the great amphitheatre around it and ensuring that it would not be buried by send again so easily; he wrote a study on this work and on the temple of Amenhotep II here; in addition the so-called Fourth Pyramid or the palace-façade tomb of Queen Khent-kawes of the Fourth Dynasty was investigated and also the funerary town of the priests associated with it; he later worked on the Unas causeway at Saqqara and at the valley temple of this king, discovering some of the mastabas in this area and two great subterranean tombs dated to the Second Dynasty; his final excavations at Giza were carried out on the east and south faces of the Great Pyramid and at the mortuary temple of King Khufu, 1938-9; he also took part in the campaign to save the monments of Nubia, and wrote a report on this subject; he published about 53 books and articles on Egyptological subjects in English, French, and Arabic, Hymnes religieux du Moyen Empire, 1928; Le Poème dit de Pentaour et Le rapport officiel sur la bataiILe de Qadesh , 1929; Excavations at Giza, 10 pts., 1929-60; The Sphinx. Its History in the Light of recent Excavations, 1949; Report on the Monunents of Nubia,1955Excavations at Saqqara 1937-8, 3 vols., 1975; in Arabic Literature of Ancient Egpt, 2 vols. ; Ancient Egypt from Prehistoric Times to the Age of Rameses 11, 6 vols. ; he died in Giza, 30 Sept. 1961. AfO 20 (1963), 310 (H. Brunner); Archaeology 14, no, 4 (1961, 293; ASAE 58 (1964), 61- 84 (bibl.) (Dia Abou-Ghazi); Orientalia 31 (1962), 271; Goettinger Miszellen 76 (1984), 78-80; Reid, JAOS 105 (1985), 237, 241-44.